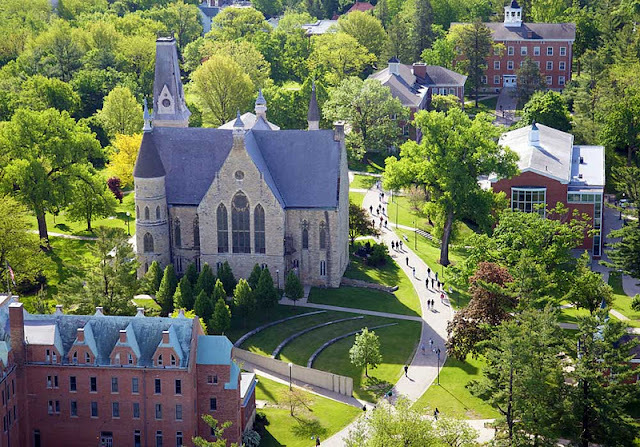 When I arrived at Cornell College in the summer of 2001, finding a husband was not at the top of my priority list. I figured I'd discover him there eventually, but two days into orientation and several days before classes were even scheduled to begin, he walked into a room and into my life. It may not have been my priority, but I did have a list going in the back of my head. That guy in my PA group is kinda cute.... the dark-haired guy in choir seems nice... but during an informational meeting for my work-study job, an unusually goofy and fun-loving man caught my eye. Actually, it was my ears that he caught first. As we were going around the room and making our introductions, Joel told the group about his love for baseball and how, as a child, his father (Bampa) returned home after seeing "Field of Dreams" and immediately woke his boys late at night to play catch in the yard. I remember going back to my dorm room and telling my roommate that I'd met a guy that seemed like a lot of fun to be around. We started dating shortly thereafter and were engaged in a little over a year. Although he didn't play college ball throughout our entire tenure at Cornell, baseball continued to be a big part of our lives, and we passed on a love for our national pastime to both of our sons. 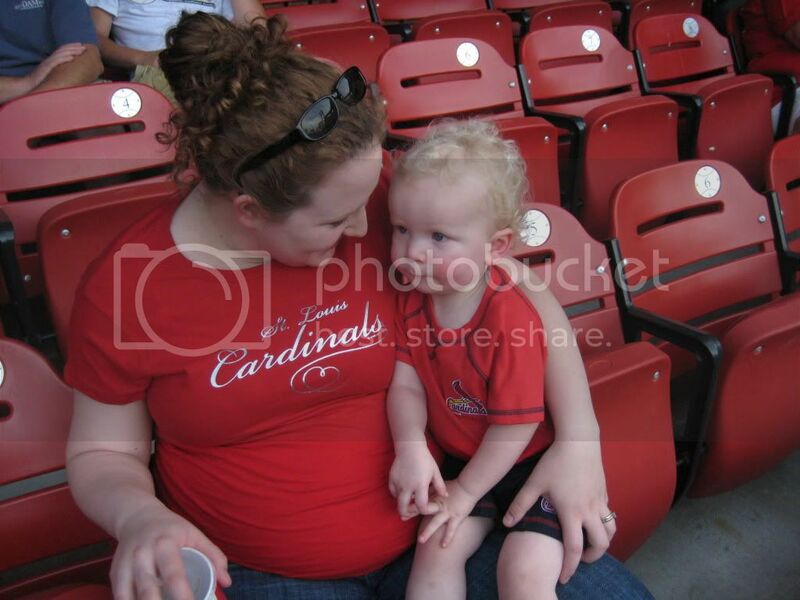 Shortly before Graham was born, we took a brief vacation to St. Louis to watch our favorite team, the Cardinals, play a home game. At not even two years old, Cael was one of their tiniest fans but one of the most enthusiastic. The stadium was hot, my extremely pregnant belly even hotter, but we enjoyed the opportunity to watch our team beat the Cincinnati Reds before our eyes. 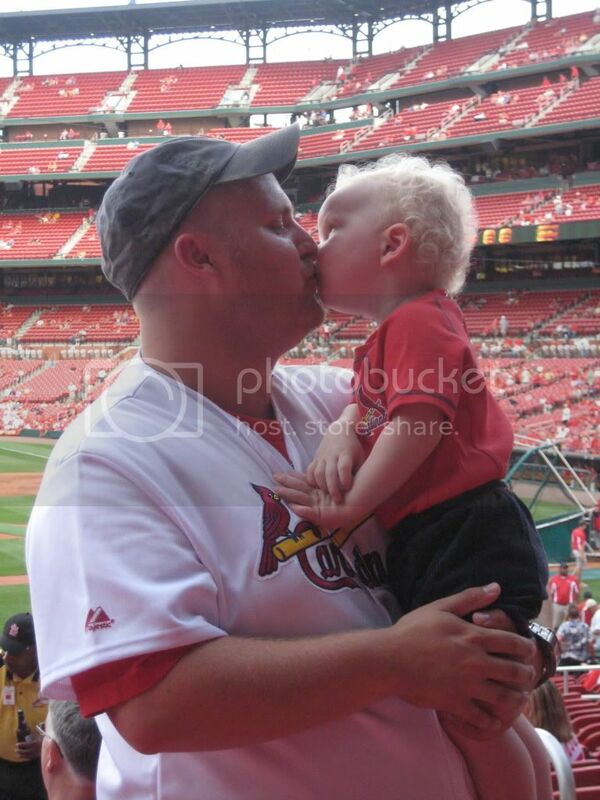 So last week when the Cardinals ascended to the playoffs and then to the World Series game, we were very excited and Cael asked nightly about his team's progress. Even Graham, who was not yet born during our pilgrimage to St. Louis, hugged his Cardinal bear tightly and prayed about baseball as I laid him down to sleep. On the night of game seven, Joel and my nephews Ethan and Keaton watched closely to see if the Cardinals could pull off a victory against the Texas Rangers despite their status as the underdogs from the very start. With the final out, the boys celebrated and Joel commented that he should have summoned Cael from his sleep to cheer alongside his Daddy. After reflecting on that thought for a few moments, we all realized that our DVR was invented for moments like these and to create opportunities for daddies and sons to relive important memories with one another. Joel quietly sneaked into Cael's room while Ethan rewound the tv and cued it up to the final inning. Maybe some day, Cael will see a girl that catches his eye and tell her about the night his Daddy woke him up to see his favorite team win the World Series. I just hope he doesn't fart. It sounds like something he'd do. ...and I love when you ask him "Do you think they're gonna win? "....b/c I'm sure he's thinking "well you better not have woken me up in the middle of the night to watch them lose!"